Postcard collecting can take you to unexpected destinations. This post is about how postcards dragged me off into suburban Canada of the 1930s. A few years ago, as part of my collecting focus on my hometown of Winnipeg, I picked up an unused real photo postcard that seemed, initially, to be of rather minor interest. 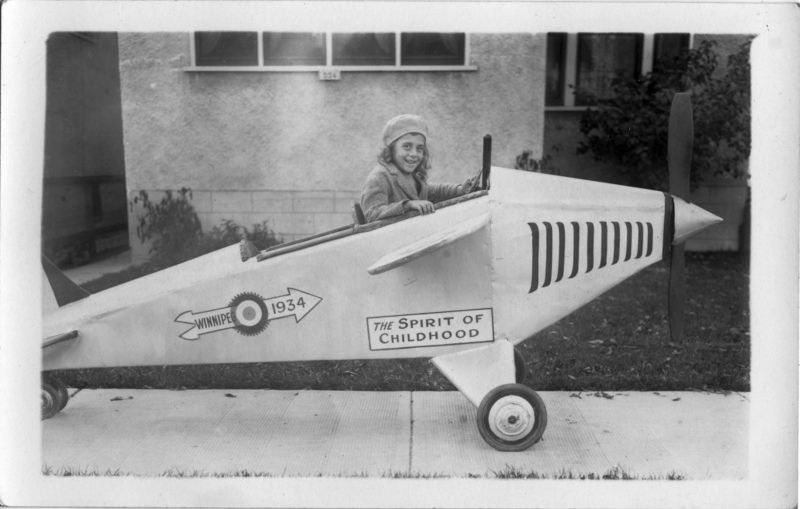 It depicted a little girl seated in a replica airplane, evidently designed for children. The craft was emblazoned with the words “The Spirit of Childhood” and “Winnipeg 1934”. The setting was the public sidewalk out front of a house of an exceedingly common local style: 934 something street; or maybe 334. Unidentifiable, in other words. The Spirit of Childhood, taking off from a Winnipeg sidewalk circa 1934. I filed it away and, I will admit, soon forgot all about The Spirit of Childhood. That is, until a few months ago, when to my surprise I came upon a second similar postcard. This one featured two girls in another replica airplane, which again proclaimed “The Spirit of Childhood”. But this time it wasn’t Winnipeg. It was “Vancouver 1934”. 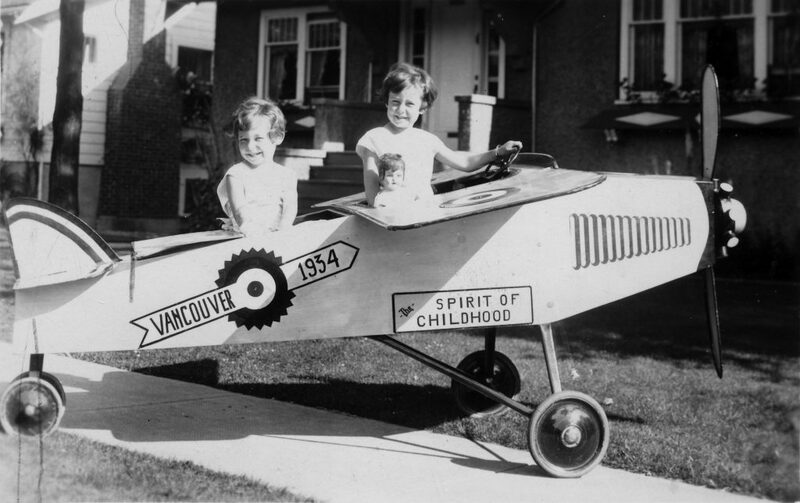 Vancouver’s Spirit of Childhood has managed to attract a passenger and a co-pilot. How odd. What was going on? Were these planes constructed from a kit ordered from (say) Eaton’s or the Bay? Not likely, it seemed — their construction and painted lettering were similar but not by any means identical. And yet it certainly appeared that they had been designed with reference to a common model and, one would presume, owed their name ultimately to Lindbergh’s Spirit of St. Louis. Since then, I’ve discovered several more examples of The Spirit of Childhood online. The Peel Collection at the University of Alberta shows four postcards of this genre (for a genre it appears to be). One card is emblazoned with “Edmonton 1931” and there are also three Calgary examples, one whose date is not captured in the photo and two that respectively represent the years 1936 and 1937. The last image that my Googling uncovered shows a similar scene of a plane that doesn’t have a painted reference to a city or a year, but which apparently came from the Yukon Territory. One useful result of this search was the revelation that the difference between “my” two planes does not, after all, mean that the designs were one-offs. In fact, if you look closely at the images linked above (plus my pair), it appears that there were two models of these planes. The “Vancouver” model appears virtually identical to Edmonton 1931, Calgary 1937, Calgary 193? and the Yukon plane, while the “Winnipeg” model looks the same as Calgary 1936. So now we are left with seven planes in two designs, dating from 1931 to 1937 and each being the subject of photographic postcards in a similar style. By that I mean that every single one of the photos has been taken on a sidewalk in front of a house — a natural place for the plane to be, I suppose, but you’d think that the odds would be that at least one out of seven photographers would have decided on some other equally good location. To speculate: could the photos have been intended for submission to an organization — to the manufacturer or a retailer, for example — as part of a contest the rules of which specified how the required photo was to look? Frankly, I haven’t a clue. Another thing to note is that — going by what shows up in the first few results returned by Google — there don’t seem to be any U.S. examples, or examples from eastern Canada. Surely that must mean something…. But all I have at this point is that these planes were made from some sort of plan or kit, that there were at least two designs in use, and that these were distributed across Western Canada in the 1930s. They may have been intended to represent something about Canadian aviation, but — if that’s the case — I’m not sure what. Anyone who might be able to shed some light on this aviation mystery is welcome to submit a comment! Tagged 1930s, aircraft, aviation, Calgary, children, Edmonton, RPPC, Spirit of Childhood, toys, Vancouver, Winnipeg, Yukon. Error: Error validating access token: Session has expired on Friday, 12-Apr-19 20:21:58 PDT. The current time is Friday, 19-Apr-19 21:17:08 PDT.